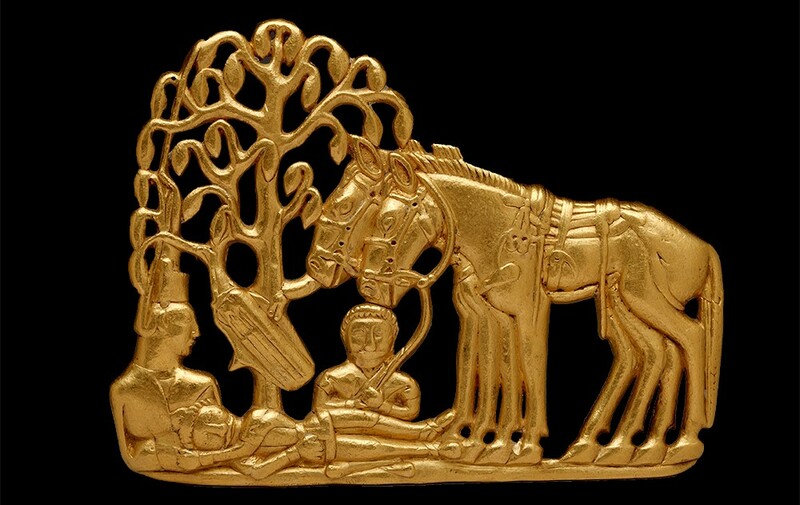 Since I began the year with a tale of adventure in the Caucasus, I thought I’d follow that up by (finally) sharing some thoughts on the Scythians show at the British Museum. I hasten to add that the exhibition is nothing to do with me: I’m simply a visitor, and an enthusiastic one at that. I’ve been round five times now and the exhibits never cease to amaze me. Excavated from the Siberian permafrost, they offer a compelling picture of a people largely overlooked by the modern world, but who were admired and feared in equal measure by their ancient contemporaries. The Scythians were lethal horse-archers, notorious drinkers, proud warriors and superb craftsmen in gold, wood and leather. And yet so little of their culture survives. These treasures from frozen tombs help to bring that scintillating world back into focus. It all began thanks to Peter the Great in the early 18th century. He heard that remarkable artefacts had been unearthed in Siberia and, as a passionate collector and the founder of a pioneering museum, decreed that all finds should be sent to St Petersburg for study. Grave robbers were to be executed. Every artefact was recorded in a series of beautiful watercolour illustrations, some of which are on display alongside the golden belt-plaques that they represent. The ravages of time have claimed some losses, but Peter’s collection still remains largely intact: the foresight of this 18th-century prince having bequeathed to us the greatest surviving collection of artefacts from a vanished civilisation. 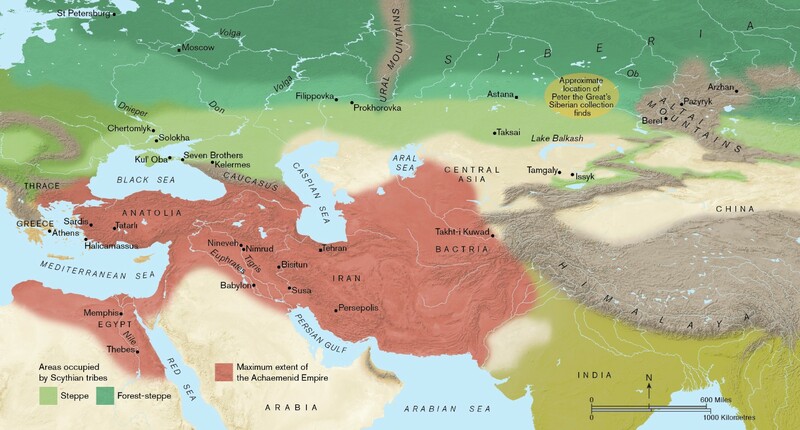 A map of Eurasia showing the extent of the Achaemenid empire (in red) and the Eurasian steppe and mixed woodland largely occupied by the Scythians (in green). Map by Paul Goodhead. People knew about the Scythians, of course. The problem was that no one had ever been quite sure who they were, or where they’d come from. Even now, the word ‘Scythian’ denotes a loose assembly of tribes who wouldn’t necessarily have recognised alliances with one another. But it helps to describe a group of nomads with similar cultures and lifestyles, who lived in the steppes, grasslands and forests of what is now Russia between roughly the 5th and 3rd centuries BC. Their territory extended as far east as Mongolia and China, and as far west as Russia. Their reputation lingered even in the early medieval period, when monastic chroniclers sometimes described the Vikings as ‘Scythians’. It was a catch-all word for savages, barbarians, ruthless warriors. But is that fair? To some extent, it’s completely fair. The Scythians were hunters and warriors by trade and they definitely had a belligerent side. They were famous for their short, powerful curved bows and their breathtaking talent as mounted archers. In antiquity, their repute extended far beyond their homeland: they were employed as city police in Ancient Athens – rather, I imagine, as ferocious Varangians patrolled the streets of Byzantium. Herodotus (who may not actually have ever met a Scythian, though he certainly managed to ferret out a lot of information about them) recorded their ‘cleansing rituals’ of joyous hemp-smoking. They even managed to flummox Darius I of Persia, who led an army into their lands, hoping to conquer them, only to discover that it isn’t very easy to ensnare nomads who don’t want to be caught. After chasing the Scythians around the steppes, Darius gave up in exasperation and went after the Greeks instead. Nevertheless the Scythians would later serve in the Persian army, and their characteristic bows and quivers seem to have been adopted by the Persians, who weren’t such bad mounted archers themselves. Scythian art also shows the influence of Persian motifs: winged bulls, striding lions and rams’ heads all appear. Indeed, one of the profound messages of the show is to emphasise how much cultural exchange there was in the 5th-3rd centuries BC, when the Scythians were at their most powerful. Jewellery, fabrics and carpets came north from Persia; silk came west from China. The Scythians weren’t remote, barbaric primitives. On the contrary, they enjoyed access to the greatest trade routes of the ancient world. And what of the Scythians’ own culture? As nomads, they didn’t build great palaces or put up mighty statues. They left no written records. Virtually every trace of their world has vanished, save in the rich goods they buried with their dead. Men and women of high status were laid to rest in tombs lined and roofed with vast logs, accompanied by their favourite horses: a warrior would want to ride his loyal steed even in the afterlife. With them, they took all the accoutrements they might need: sheepskins; furniture like a little wooden stool with turned legs; superbly carved bridles for their horses; an extraordinary wooden head-mask, also designed for a horse and perhaps with some ritual purpose. There are delicate embroidered shoes, the soles decorated with patterns of studs; quivers; squirrel-fur cloaks; iron-scale armour; magnificent golden swords, as dazzling as a Persian grandee’s akinakes. One of the most astounding treasures is a little felt swan (actually more likely to be a crane, as someone pointed out to me), as perfectly preserved as if it had been bought from a craft fair yesterday. Yet this most fragile of objects was buried in the Siberian ice in around 300 BC. Utterly extraordinary. The most breathtaking Scythian works of art are those which first caught Peter the Great’s eye: the gold. Without permanent settlements, the Scythians wore their wealth as personal adornment, and their chieftains must have dazzled. Their belts were clasped with large golden plaques, sometimes several inches in length, in the shape of sinuous animals, predators wrestling with their prey, or figurative scenes that remain enigmatic. Is a composition like the so-called Funerary Scene supposed to represent a dying warrior resting in the lap of a goddess, as scholars believe? Or does it show a story from the life of a great chieftain, or a Scythian hero? Could it simply be a sentimental scene showing a warrior, his wife and servant resting under a tree? (Trees, interestingly, seem to have had the same spiritual power in Scythian belief as they did among the Persians.) There’s so much we still don’t know – and can never know – about what these glorious objects meant to the people who made them. What we can tell is the phenomenal level of skill that Scythian goldsmiths must have had: no mean feat, when permanent forges and workshops must have been out of the question. Moulds were used to cast tiny golden appliques, such as those displayed here in the shape of predators, which would originally have been sewn onto tunics in intricate swirling patterns. The golden belt-plaques, with their ‘animal-art’ designs, were painstakingly cast and polished, and inset with coloured stones, enamels or gems. Turquoise was a special favourite. Most of these insets have now been lost, but the belt-plaque in the shape of a curled panther clearly shows the empty settings. Intellectually, I know perfectly well that the ancient world wasn’t monochrome, but I find it very hard to imagine swathes of colour. This exhibition helped with that: the frozen tombs preserved fabrics and coloured leather to an extraordinary degree. Even the people themselves were decorated. The exhibition includes fragments of a chieftain’s tattooed skin, on which you can make out the rear part of a prowling clawed beast, with a striped tail. There are also beautifully-painted funerary masks, excavated in an area further east, towards China. Perhaps the most exciting thing about this show is that work still continues: there’s much still to be discovered, and archaeologists continue to work today with the same dedication and care that Peter the Great’s scholars showed all those centuries ago. The structure of the exhibition is cleverly arranged so that you pass from those earliest excavations (under Peter), through later discoveries, and finish up with finds from sites which are still under active examination. We’re never really going to know who the Scythians were, and the cultural world in which they lived, but this exhibition did much to clarify my own limited understanding. The nature of their culture means that, by necessity, we’re seeing not the living world of the Scythians, but the objects that they chose to send into the afterlife, along with their great men and women. We can’t be sure that all these objects were used as widely in everyday life – perhaps some, like that strangely eerie horse’s mask, only appeared in funerary rituals. But we do know that they were considered valuable assets to a Scythian travelling from the steppes of his fathers out into the world beyond – wherever and whatever that might have been. Beautifully displayed, staged against a soundtrack of atmospheric hoof-beats and Siberian winds, this is one of the most magical exhibitions I’ve seen in a long time, and it does exactly what (in my mind) the BM is supposed to do: introduces you to unknown lands and mysterious peoples, and leaves you eager to know more. Do please go, if you get the chance before the show ends on 14 January. If you can’t make it to London before then, the catalogue has excellent photographs of the artefacts and, though the notes themselves are rather academic, there are absorbing essays and section introductions which help to bring this world to life. While in New York recently, I was thrilled to discover the catalogue for Scythian Gold, a show which travelled in the US and France in 1999-2001, presenting a selection of artefacts from the National Museum of the History of Ukraine. I’m looking forward to reading that, and building up an even richer picture of this incredible culture. It was one of the three best things/places/exhibitions that made the biggest impression on me last year. The other two were also not bad at all – Palazzo Massimo with frescos from the Livia’s Villa and Portonaccio Sarcophagus and the Lion Hunt of Ashurbanipal in the BM. You know that we also had a good time and we have lots of nice memories from our last visit. Hoping to catch a look before it closes … thoughtful and informative as always. Thanks. You’re very welcome. I do hope you make it! Be sure to let me know what you thought of it. Went today with Mum based on your post (Mum has recently become very interested in Scythians, of all things) and loved it! She thought it was one of the best exhibits she’s ever seen, so big thanks to you 🙂 I’m actually not sure where to start, perhaps with that funerary horse mask?! Or the intricately detailed animal contests? Or the bridles?